TOKYO (Sputnik) – Russia and Japan are currently only examining the technical and financial issues of constructing an energy bridge between the two countries without any commitments, Japanese Minister for Economy, Trade and Industry Hiroshige Seko told Sputnik. “As far as the energy bridge is concerned, without predicting any results, we are carrying out joint examination of different issues of the system plan, from the point of view of technology and costs, without any commitments,” the minister said. 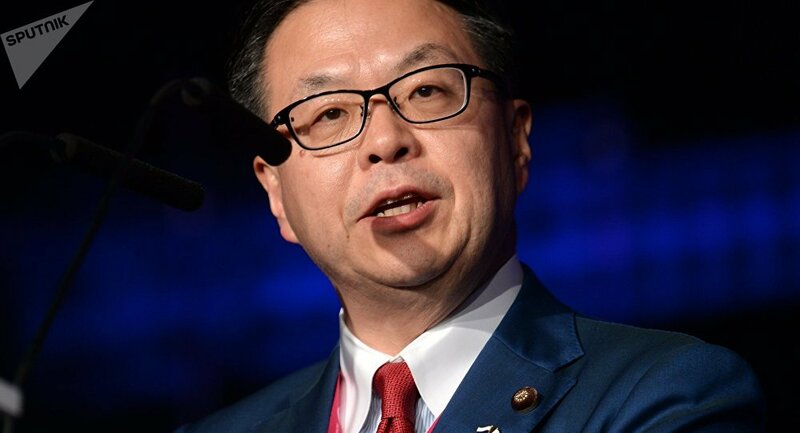 Japan sees difficult challenges in construction of the Sakhalin-Hokkaido gas pipeline from Russia, and considers it necessary to examine the project’s profitability as compared to supplies of liquefied natural gas, Japanese minister said. “There are difficult challenges ahead of he implementation of the Russia-Japan gas pipeline project, such as deciding who will be the subject of investments in construction, deciding on the route …, what to do with fishing and ensuring security … First of all, it is necessary to study the profitability for private business as compared to, say, LNG,” the minister said. Hiroshige Seko told Sputnik that he plans to participate in the upcoming Eastern Economic Forum in Russia's city of Vladivostok in September and also confirmed that a delegation of Russian businessmen will visit Japan to promote cooperation the same month. "I am planning to take part in the upcoming Eastern Economic Forum in Vladivostok if the circumstances allow," Seko said and noted that the agenda of his visit is currently being worked through. The minister went on to add that the delegation will visit the Japanese island of Hokkaido and take part in a business forum in Sapporo in order to foster ties on the private sector level. "In this regard, work involving Japanese-Russian businesses and regions leads to a further deepening of bilateral cooperation, and the Ministry of Economy, Trade and Industry would like to support this," the official said. The third Eastern Economic Forum will take place on September 6-7. It was established in 2015 as a platform for cooperation between business and political representatives from Russia and the Asia-Pacific region. The event will be attended by a large number of top international officials, most notably Russian President Vladimir Putin, Japanese Prime Minister Shinzo Abe, South Korean President Moon Jae-in and Mongolian leader Khaltmaa Battulga. Russian-Japanese relations have been on the rise, especially after a series of meetings between Putin and Abe. In May 2016, Abe presented an eight-point bilateral economic plan, which covers various areas of Russian economy. The business ties between Moscow and Tokyo also gain momentum as a total of 68 commercial contracts, including plans to set up a joint investment fund for financing projects worth up to $1 billion, were signed during Putin’s visit to Japan in December.